As I mentioned in a previous blog, I’ve been getting caught up in US politics the last couple of months as the primaries go on around me. 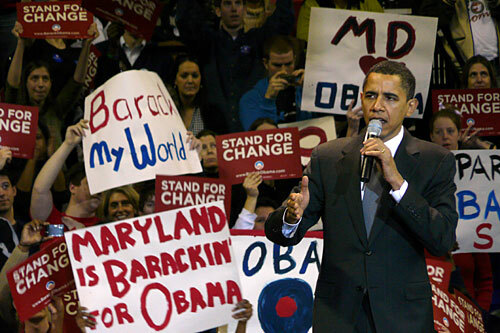 Yesterday I actually had a chance to see Obama speak live in front of 17,000 people at the Baltimore Arena, 2 blocks away from where I work. The whole office pretty much emptied out to go and see him, and even though I had meetings and didn’t get there until about 2-3 hours later, it turned out Obama was even later than me so I didn’t miss a thing! A strong country will deal with its enemies as well as its allies and will not be afraid to state its position on hard issues. He quoted JFK on this one, but he’s right. America has screwed up its whole reputation around the world because everyone is afraid, the whole country is afraid of terrorists, and the government has perpetuated that fear and acted in fear by attacking Iraq without any support from the global community (other than our tiny little island, and that was mainly Blair, not the British people). Its been said again and again, Syria and Iran should be bought to the negotiation table in helping sort out the mess in Iraq, but the present government will not deal with them (only some talks recently), most of the arms for the Iraqi resistance are coming from these countries and without dealing with them properly America’s basically perpetuated the situation. Obama mentioned Darfur, that these should be the things America should be using its huge military for, not invading a country because “we’re too afraid to talk”. That’s exactly what I’ve been saying for a while now! With globalisation keeping wars at bay, the developed western nations should be using their forces for peace keeping, stopping genocide in countries that can’t protect themselves, not starting wars that end up screwing up a whole country and region. He puts global warming as a priority, where America must “lead by example”. Just like I said in my previous blog, developing countries like India and China aren’t going to take the lead on this, and the biggest worldwide polluter, the US, needs to take the lead on this urgently! He understands that America must compete in a global society, where more engineers and scientists are being produced every year in China and India than the US could ever hope for! This isn’t just a problem for the US, but all western countries who have seen education levels slip as they become “softer” on students and examinations. I just read an article that UK students are being encouraged to NOT take Maths at A-Level because its a “hard” subject and schools want to keep their top place in the league tables! But in between the sound bites that every politician spiels in speeches during campaigns (and there were plenty!) the bit I liked the most was about hope. This guy actually wrote a book on it, “The Audacity of Hope”, not that I read it, but from the title and what he said in his speech I can get a glimpse of what its about. The US for too long has been a fear monger, using fear to win votes, and justify actions around the world. Obama preaches a different beat, which is why he is inspiring a whole new generation of voters, one of action on hope and optimism, looking forward to a better future not a worse one. Clinton accuses him of being unrealistic, that hope is like day dreaming, the fact is hope is what got a black man to become one of the forerunners in the presidential campaign, and it is what the US needs to correct all the mistakes made over the last 8 years. Not everyone welcomes change, I would actually say I am in the minority that accepts it, even looks forward to it, I would think the hardest thing about leading a country is bringing the majority, who do fear change like the changes globalisation brings to their job security, the changes caused by global warming, on board to overcome those fears and allow change to happen, drowning out the resistance of the fear mongers andskeptics that will inevitably try to interfere. I understand this personally, I am usually very optimistic, I live my life looking at a brighter future, not a darker one. I would actually say I am more successful because of it, I take “risks” that I would never take if I didn’t have hope. And that’s what the next leader of the US needs, to make the changes that are needed, the whole country needs hope and optimism. As Obama said himself, no one has ever achieved great things without hope, and the country needs someone with exceptional vision and hope to ensure everyone makes the necessary changes needed. There are a lot of hard changes that need to be made, and whoever becomes president will need to inspire people to look optimistically at the changes, they can’t do it without the people’s support. This for me is what a true leader should be, someone who inspires people to achieve the best of themselves and oversee the challenges and fears that change brings. Obama has no experience in anything except anti-American hatred and political deviciveness. His buddies hate America. His wife hates America. His change and vision are focused on how thick his wallet will be. His rhetoric is like a freshman drama student hoping to get discovered. I’m glad you can’t vote. Of course I disagree, but then I think many people would with extreme comments like that backed with no evidence! I haven’t heard Obama say or do anything that would warrent your opinion, I can only guess you’re a republican stuck in “Bush’s BS” where to be American and LOVE America you have to support a war that has screwed up an entire region over oil, and where its OK to be the only major developed country in the world not enforcing any CO2 emmission limits to save an out of date car industry focussed on fuel-guzzlers while the rest of the world is trying to build smaller, more efficient cars…need I go on, the fact remains whether he’s an amature or not, maybe a fresh perspective from the crap that the rest of the world has had to put up with the last 8 years from one of the most retarded presidents in world history can’t do any harm.